flat assembler - fasm autoload of asm files? flat assembler > IDE Development > fasm autoload of asm files? In the next update of fasm for windows ide version, could you allow the files that you were working on before to be automatically reloaded again without going to the open file requester and re-opening each file? cool down? I wouldn't ask the question if I knew how to modify the sources. I will eventually learn how to program in windows assembly, but not in the near future. This would help me (and others) if when opening fasmw, it would auto-load sources worked on in the last session. maybe using the fasmw.ini file to store the file information? Anyways thanks to PRIVALOV for an EXELLENT assembler and IDE!! You are right, that sometimes FASMW misses important features. 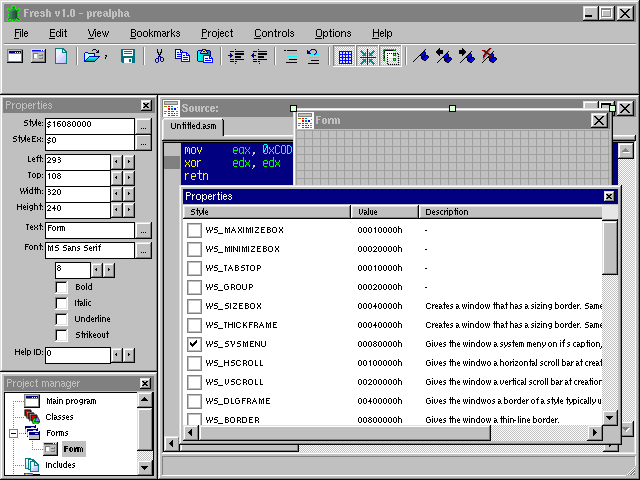 But don't forget that FASM is multiplatform assembler and Privalov, mainly works on the assembler itself and at second place on IDE version for Windows (FASMW). Why you don't look at comrade's version of FASMW. Second oportunity is to use RadAsm with console FASM, but actually I don't like this variant, because you have to use external linker. Also, just now we are working on very big IDE for FASM - the project Fresh. Unfortunately, it is in early developement stage, so you can't use it. In the future, when Fresh becomes working, it will have project support and many other features for working on big assembler projects. Second oportunity is to use RadAsm with console FASM, but actually I don't like this variant, because you have to use external linker. Why In RadASM if you do not want to use a linker, you haven't to do it. I ment whenever he has time and if it will be easy to do, I don't want him droping everything and fussing over code when he has a hot date or something This was just a suggestion, nothing more. I'm sorry if it came over any other way. About your FASM ide project, sounds good!, do you have a website and a screen shot(s) of the progress? and of course it will autoload files on startup! About your FASM ide project, sounds good!, do you have a website and a screen shot(s) of the progress? and of course it will autoload files on startup! The project Fresh, have not a site for now. It exists only here in the FASM board. We have no screen shots, but you can download the project (look at the IDE forum for the last version. (Currently 1.0.0A pre-alpha) These days I will release the next 1.0.0C (B will be skipped). It will be greatest IDE, but this is only the team opinion. It will be greatest IDE, but this is only the team opinion. (Windows didn't wana start to day so I started coding under Linux instead (fasm works great in Linux too), and started playing with Wine (the windows emulator, www.winehq.com) ). btw, the window is actually 640x480.